“You’re kidding! That’ll be handy,” I casually replied, quiet embarrassed. What I didn’t tell her was I’d unsuccessfully tried different ways to keep my paper from dashing to the floor, including a stapler strategically positioned in front of the paper shoot. Silently, I made a mental note to pay attention to my instruction manuals in the future. I realized if I had with my printer, I’d have seen that it had a pull out tray. Grateful for my friend who showed me a better way of printing, I began thinking of all the people God has brought into my life to show me a better way of doing things; whether little or big. First and foremost, I’m grateful to my family and friends. I continue to learn better ways of doing things from them. I’m grateful for my non-profit ministry Board members. Their wisdom and counsel have been the driving force behind ways we’ve fulfilled our mission to spread the Word and love of Jesus. When I was content writing and teaching for Bible study groups in the hill country, they suggested a better way for us to spread God’s Word: through a publisher. God is available to address every issue in our lives and to show us a better way; many of which we would never think of on our own. Do you have challenges with your children? Are you befuddled about what to do with your finances? Do you long for a closer relationship with your spouse? Do you need direction regarding work? How do we discover God’s better way? The same way one discovers the pull out tray on a printer. We read His instruction book, the Bible. We spend time with others who are familiar with God and learn from them. We spend time with God in prayer. God has a better way for us to live, work, minister, raise our children, and relate to Him and others. He invites us to His better way. Years ago I asked God for a better way to keep track of my prayer requests and praises. 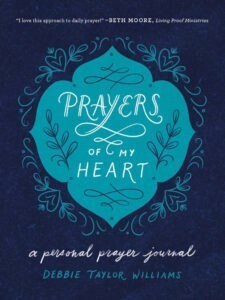 He showed me a better way that I’ve been using and sharing with others: Prayers of My Heart prayer journal. Join me this Sunday, September 9, 5:15-6:30 at Trinity Baptist Church for Prayers of My Heart Prayer Journaling Workshop. Discover the 7 Benefits of Journaling, how to enhance your prayer life, and develop an attitude of gratitude. What: Prayers of My Heart Prayer Journal Workshop. Journal available to purchase at the Workshop. Who: You’re Invited! Join us at 5:15, get your journal, hear & see how to pray more effectively and develop a mind/heart of gratitude.